It’s official! Today, Netflix announced Alexa & Katie has been renewed for a second season. 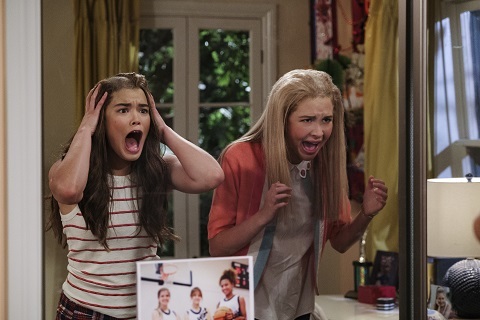 The sitcom centers on the friendship between two high schoolers, Alexa (Paris Berelc) and Katie (Isabel May). The cast also includes Tiffani Thiessen, Eddie Shin, Jolie Jenkins, Emery Kelly, Finn Carr, Adam Ian Cohen, Iman Benson, and Merit Leighton. Netflix’s “Alexa & Katie” to return for Season 2! We’re happy to report that Alexa & Katie, Netflix’s first tween sitcom, will be returning for a second season… sophomore year, here we come! Alexa & Katie, Netflix’s first fully produced tween sitcom, is a funny and heartwarming show about two best friends eagerly anticipating the start of their freshman year of high school. Despite the fact that Alexa (Paris Berelc – Mighty Med, Lab Rats: Elite Force) is undergoing cancer treatment, her outgoing personality and enthusiasm for life never falter, especially with her loyal and awkwardly adorable best friend Katie (newcomer Isabel May) by her side. At times they’re left feeling like outsiders, during a period when what seems to matter most is fitting in. Tiffani Thiessen (White Collar, Saved By The Bell) also stars as Lori, Alexa’s determined and protective mother. Created and executive produced by Heather Wordham (Hannah Montana, Reba), the show’s star is Alexa and Katie’s friendship; whether it be at school, at home, or in the hospital, they are by each other’s side through thick and thin, serving as role models for modern-day female friendships. What do you think? Have you seen Alexa & Katie? Will you watch season two?